Changing your flooring can seem a bit daunting and sounds expensive. But here we explore 10 value flooring ideas which don’t cost the earth and are easily achievable and look fabulous. A great alternative is to paint your floorboards instead. You can choose a single colour or create a pattern. 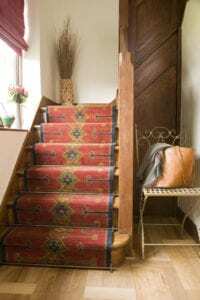 Not such a warm option as carpet and you may need to sand your boards first but you can transform a room. I love the Little Greene company paints. They provide a focal point and give the illusion of making a staircase appear wider. 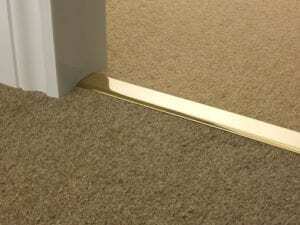 Available for fitted and runner stair carpets, they don’t have to cost the earth. Take a look at the Homepride or Jubilee stair rods which start at just £9.95 each including brackets. 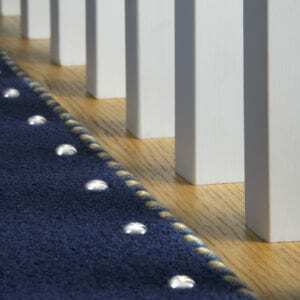 They also divert attention away from what could be a pretty boring stair carpet. 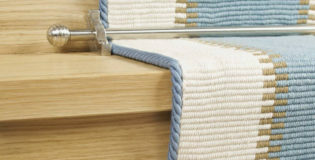 The Easybind range of trims is fabulous and come in loads of gorgeous colours. Choose a colour of trim that is vibrant and contrasts with the carpet to create an eye-catching design feature. It’s inexpensive to do and you can afford to have fun and be a bit whacky! Replace them with some matching, smart Premier Trims. The Premier range is made of solid brass, are really sturdy (so, no problem with the hoover or kids’ bikes) and come in ten great finishes, including fashionable brushed chrome and black. It is far cheaper to smarten up the overall look by changing the door bars rather than investing in new flooring. However vigilant you are about taking off your shoes, carpets get dirty. Hiring a professional to come in and clean your carpets is a low cost solution to re-vamping a room. You may be surprised what pattern is lurking under the grime! And, they are so much easier to maintain – a quick wipe clean and you are sorted. They are also a great conductor of heat if you have underfloor heating. Companies like Craven Dunnill offer a wide selection of wood-look porcelain floor tiles from around £30m². The new Petit Parquet range is a great example. 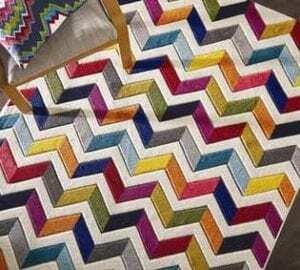 It can be fitted in any number of different patterns, including chevron and basket weave and block – all very in vogue. The rough tile step which just “appeared” when the bathroom guys replaced your floor and didn’t realise it would end up 10mm higher than your landing floor. Or the frayed edge of the carpet where it joins the new parquet floor going into the dining room. You know where I mean! They are great fun and add a touch of style for under £20! However, just make sure you don’t tap into any underfloor heating! Yes, it takes time but it can look amazing. There are some fabulous paint colours for floor paint and you can go mad! Modern-Rugs has an endless choice at affordable prices. So, have some fun this coming year and try out some new flooring ideas in your home!